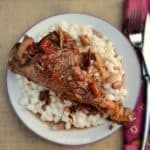 Red Wine Lamb Shanks (Slow-Cooker) are juicy, fall-off-the-bone delicious and much better than any at a restaurant! 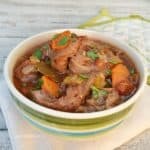 Red Wine Lamb Shanks are one of my husband’s favorite meals to order at a restaurant. 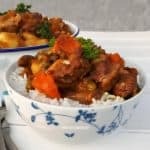 I decided to surprise him with a homecooked, slow-cooker version a couple of months ago and it turned out fantastic.